When you are in need of a new HVLP paint sprayer, it is wise to check out the HomeRight Finish Max. It has been a bestseller, and for good reason. The HomeRight uses a high volume of air at a low pressure to apply the best finish possible. In addition, you’ll enjoy the trigger control knob which can be used for three settings. It can also be taken anywhere for a quick project due to its lightweight. What Paint Tasks Are This Sprayer Best For? For an affordable price, you can own a lightweight HomeRight Finish Max sprayer for your small household projects. Save yourself time over using the typical paint rollers and brushes. Save yourself money from hiring a professional painter. This sprayer allows you to increase or decrease your paint flow by simply turning the knob. This allows you to adjust your width and intensity of the spray to accommodate your specific task. It also allows you to spray in a vertical, horizontal or round pattern when you twist the cap at the top of the sprayer. Before painting, you can use the viscosity cup and handy thinning chart to help you determine the amount of thinning that is required for your materials. Simply pour the liquid into the cup and time how long it takes to drain. The run out time needs to fall within a certain frame to be ready for spraying. The run out time needs to fall within a certain frame to be ready for spraying. At just over 3 pounds, you can take this sprayer anywhere with you. It won’t wear out your hand while spraying and it is easy to use. When the painting is over, you simply clean the cups out with warm soapy water and you are done. The brass spray needle and housing will offer a longer life and improved performance. You can also upgrade to the next model, the Finish Max Extra. That model includes a variety of spray tip sets, two different air caps to help control the material flow and a larger 52-ounce container. Are This Sprayer Best For? The HomeRight Finish Max is ideal for your smaller household projects. It won’t work as well if you are tackling medium to larger-sized projects. Consider using it to paint or stain your furniture, cabinets, and chairs. It is also ideal for DIY craft projects. The HomeRight Finish Max sprayers perform best when using oil or water-based materials. Many customers have found them to be good with chalk-type paint, milk paint, enamels, latex paints, primers, sealers, stains, varnishes, and polyurethane. Just be sure you thin your materials to the appropriate viscosity before spraying. This sprayer is best suited for a beginner painter. It is easy to setup and cleanup making it a breeze to get small jobs done quickly. You are not going to pay a lot less to purchase the HomeRight Finish Max Sprayer versus the Extra model. Around $30 more on Amazon. This is suitable if you don’t need the additional items that are contained with the Finish Max Extra. For most household users working on the everyday small projects, the Finish Max Sprayer at the lower price point should be sufficient for your needs. If you want a variety of spray tips, different air caps or a larger container, then it might be wise to upgrade to the Finish Max Extra. It will also offer a little more power than the lower cost model. Let’s take a look at some of the other handheld paint sprayers and see how they compare in price. One of the top handheld sprayers is the Graco TrueCoat Pro II, but it is much more expensive. In addition, it is probably more than the average homeowner doing occasional projects would need. The Tacklife SGP15AC is comparable in price to the HomeRight Finish Max Sprayer but isn’t necessarily the same quality. While the HomeRight comes with many happy customers, the Tacklife doesn’t have as much of a reputation. On top of that, it is made from ABS plastic and isn’t made to withstand years of use. 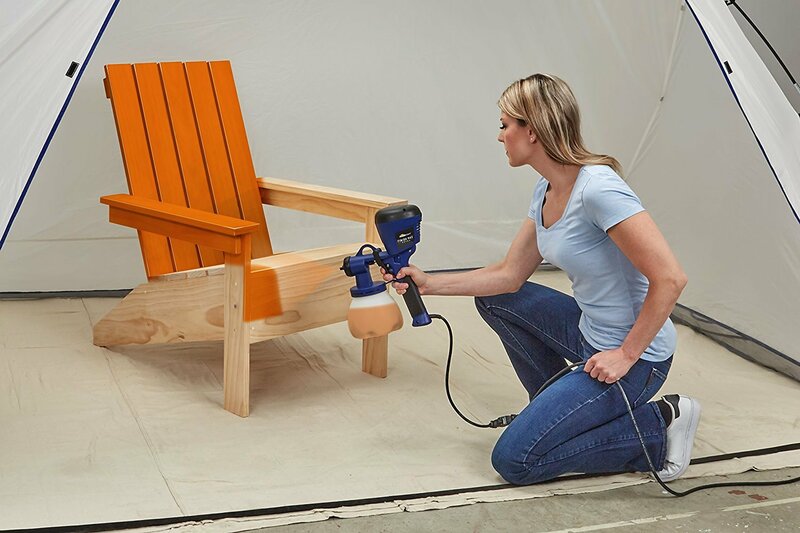 Another model that many people will choose who need a small paint sprayer is the Wagner Control Spray Double Duty. It is going to cost slightly more, but comes from the Wagner brand and is great for decks and stains. I think the biggest selling feature this spray gun offers is the price. It is hard to find a decent sprayer in this price range. It is a great tool when spraying small jobs which are great for most homeowners. The ease of setup and cleanup making it ideal to use over paint brushes and rollers. In addition, you can accomplish light coats with this sprayer. This makes DIY craft projects a breeze. Finally, the light weight of this unit makes it easy to complete your projects without hand fatigue. If you are looking at completing some larger projects such as painting the walls, you aren’t going to want to use this sprayer. You will be constantly refilling the materials and it could take a while. Many materials will need to be thinned properly to complete the job. The nice thing about this is that the unit comes with a viscosity cup and thinning guide to make it a little easier. For the price, I didn’t expect it to come with a sturdy body. The HomeRight features a plastic body that may not withstand years of projects. If you think that you are going to need something more reliable over time, you’ll want to look to one of the more expensive and better-built models. If you are purchasing the HomeRight Finish Max Sprayers, your next accessory to check out is the Large Spray Shelter they create as well. It is great for spraying your medium to large-sized furniture with less overspray onto unwanted items. It is portable and lightweight, so anyone can use it. You can literally set this shelter up within minutes and then pack it away for storage just as easily. The curved three-sided design will help direct the paint flow down towards the ground. In addition, the mesh screen will protect your freshly painting projects from bugs, wind, leaves and other debris. If you are only using your sprayer for minor household work, these two HomeRight Finish Max Sprayers might be a good choice for you. They will save you money and time over using the typical painting tools. If, however, you find that you are in need of something more powerful, or that might last longer, you might be more interested in checking out a sprayer such as the Wagner Control Spray Double Duty.